The LTU stress trailer is a wireline-activated borehole equipment that includes straddle packers with an electric imager, designed to conduct hydraulic stress measurements in slim boreholes. 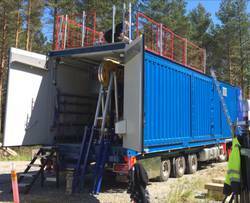 The stress trailer has a maximum depth capacity of 3 km and can conduct tests in 3 borehole sizes (NQ, HQ, and PQ, or 76, 96, and 123 mm, respectively). It is mounted in a 40-foot container on a mega-trailer and includes 3 winches, low- and high-pressure water hydraulics, manifold, water tanks, borehole equipment and heater for measurements in cold climate. Maximum system pressure on the surface is 650 and 1378 bar, respectively. Maximum testing temperature is 85°C. The weight of the system is 40.5 t.
The straddle packers are used to pressurize the borehole section and eiter generate a new fracture or open a pre-existing fracture. Imager data is used to identify potential de-coupling zones and to measure the orientation of tested fractures. This radically reduced the uncertainty in data interpretation. The data acquisition system is digital but data is also converted to analogue signal to surface. At surface, approximately 40 data streams (electrodes, pressure sensors, orientation sensors, temperatures) from the borehole are integrated with data from surface sensors (pressure sensor, flow-meter, length, speed, cable tension) using Labview. These files are then converted to Matlab for data interpretation. The "LTU stress trailer" is available for scientific and commercial projects. The infrastructure is located at the Division of Geosciences and Environmental Engineering, Luleå University of Technology (LTU), Sweden and was funded by the Swedish Research Council (Vetenskapsrådet) and LTU.